My second speaking gig for 2019 is approaching at a vertigo-inducing speed (hey…wait..someone stole January?? ), heading to Hobart as part of the NEW primary training course that ACNEM have created and will be rolling out this year around the country. I am really pleased to be one of the new presenter/practitioners to help ACNEM deliver their renovated course, with a renewed focus on delivering independent, unbiased and high quality training. My specific mission, the Micronutrients…I am like a pig in mud! More information on the Primary Modules can be found here. This module will address a number of the most common functional and inflammatory gastrointestinal complaints that present to clinic. Conditions to be covered include gastritis and reflux, constipation, Inflammatory Bowel Disease and Irritable Bowel Syndrome, from pathogenesis to treatment. 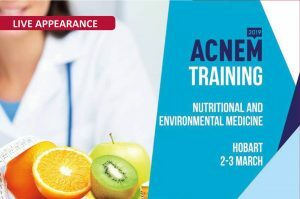 Our highly regarded presenters will bring their clinical experience and knowledge on the application of nutritional and environmental medicine in collaboration with conventional medical practice. Current scientific evidence for the effectiveness of treatment modalities will be presented including nutraceutical prescription, dietary manipulation, lifestyle modification and environmental factors, alongside the range of available testing and investigation options. More information on Gastrointestinal Health can be found here. When you get clinicians with extensive real-world experience talking about the things they know best, not just academically but also clinically…then you’re in for a very practical & clinically impacting learning opportunity.